Coming of age: She’s just a few days from becoming officially an adult and this transition tends to have problems that do not need too much explanation. Still connected with and depending on parents. Yet getting independent and about to bear all responsibilities. Cast out: Because of the lack of an ability she is a cast out in her settlement and daily mocked. Considered a lower level of existence. A mere Homo Sapiens. She also faces the insecurities women tend to have and sometimes makes mistakes by them. Bear in silence or lash out without ascertaining. The book has an unusual first person view style and language that at first may seem peculiar, but soon it becomes one of its main strengths. The language means a lot and not just a stylistic choice. 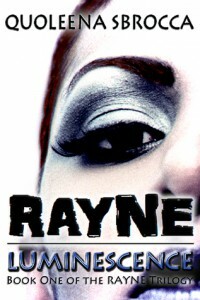 It describes the society Rayne lives in. I don’t intend to write more about the story. Not just to avoid spoilers, but because the main point is living the moments within. This was unquestionably a five star experience for me. Quoleena did a great job and earned herself a place on my bookshelf. – Young women and those who remember how it felt.